Nintendo launches its next adventure when Fire Emblem Heroes arrives soon on mobile. Fire Emblem Heroes is an original strategy RPG about two warring kingdoms in a bitter clash. As a summoner, players build their army by calling upon popular Fire Emblem heroes from worlds that span the breadth of the series. Players will wage tactical battles streamlined for on-the-go play and level up a mix of new combatants and legendary heroes. Some familiar hero characters will become allies, while others will become enemy generals. 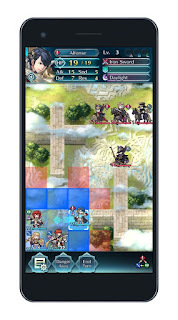 Players can enjoy the full majesty of tactical role playing on bite-sized maps designed to fit nicely on a smartphone screen, even when playing in short bursts. Players lead their armies with easy touch-and-drag controls, including the ability to attack by simply swiping an ally hero over an enemy. If they manage to defeat every enemy on a given map, victory will be theirs. I will be honest, I have not played a Fire Emblem game. I however am aware of the series and since I have enjoyed the Nintendo mobile games so far, I figured I would download this game as well. The gameplay is easy to pick up. It is a simple tactical role playing game that looks and works great on the mobile device. 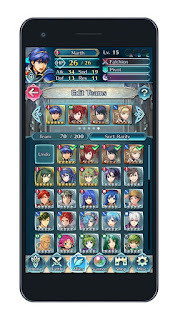 As the “summoner” of the group it is your job to summon strong heroes to the team to help in the battle. In the game you obtain orbs that help you summon the heroes. The drop rates for the classic heroes are very low so keep that in mind that you will be working to build up characters with the hopes to gain a strong character in a summon. I am sure you are wondering what the heck those feathers that you keep gaining but do not see anywhere to use them. The feathers can be used once a hero reaches level 20 and help them gain additional abilities and strength. At this time it does not appear to be any way to interact with your friends but it looks like the ability will change in the future which will be great. So far I have been lucky and have won all my battles but I am sure I will go up against a group that will smack me down and I will forced to go to the training arena and just work to make my characters stronger. The game is free to play so definitely check it out and let me know your thoughts in the comments. Fun but I still don't have Roy. My heart is still hurting.